$15 for 1 month on match.com. The description for the deal said: "Ready for Love?" Quite suddenly I became fairly threatened. I don't know Living Social is your mom ready for love? Why are you all up in my bidness? Then I remembered my list of things I wanted to accomplish this year...going on a second date was one of them. Seeing as I have made zero attempts to go on a first date I started thinking about whether or not I'm truly ready to be in a relationship. "But Jones you're 26 you've never had a boyfriend and you have admitted openly that sometimes you just gotta pick your nose...you're essentially on the top of every eligible bachelor's list." I know everyone...I know....but after some soul searching and declining Bradley Cooper's call AGAIN...I just found myself with more dating questions than an answer. This weekend I taught myself how to crochet a sloth. If I wanted to I could have a whole family of sloths sit on the couch and watch TV with me. When do I tell a man that I have knowledge and have spent hours teaching myself this skill? When do I stop impressing him by being neat and tidy and admit that when I come home I have a heap of pants on the floor....not because of other gentlemen callers but because when I get home I drop trou quicker than Mr. Rogers could change his shoes and sweater. I've lived alone so long I don't wanna really have to start wearing pants longer than working hours. This analogy has lost it's depth but I feel like you catch my drift. When can I admit that after a stressful day I really just like watching television while I eat my fat food of choice: fritos...directly from the bag. Do I tell him that I was a Dixie Chick for Halloween one year? Do I take down the framed picture of Adam Levine and Lewis the frog? 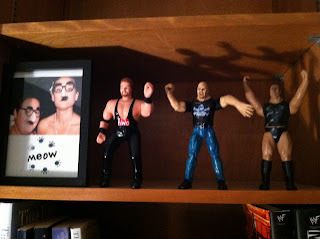 Do I explain these 3 wrestling action figures on my book shelf? Do I let him know that if there is ever less than 2 diet Pepsi's in the fridge I act like any mother in a Lifetime movie who's daughter was kidnapped? When do I say I like to sit more than I like to be outdoorsy? How do I eloquently tell someone, "I just want to bro out with a dude, watch sports and movies, hold hands and make out...other funny business can be discussed with my agent..."
I don't have an agent but when do I tell him that? Is it bad if I don't schedule dates on Mondays from 8-10 during Bachelor season? When do I reveal that I have seen the American Idols Live tour twice? How do I know that a person I meet in real life isn't going to kidnap me and ask me to put the lotion on the skin? Have you seen Jodie Foster recently? How do I explain the fact that if I think a boy is even remotely attractive I have a hard time making eye contact with them because I'm convinced I have something in my teeth or a booger making an aggressive attempt to make itself known? These are my confessions y'all. Real legitimate fears that I don't know how to make public to someone who decides they'll date me. It's been 2 days and I've caught myself saying "you're definitely a murderer" or "I'm going to end up in your trunk," only a couple of times. I'll claim that as a win. So instead of What would Jesus do... this is like like Who Would Ashley Do? Story of my life. Also, lots of the match.com prospects are upcycled from okcupid. Fun fact: I don't like them anymore when they are paying $20 a month to be creepy. you.are.hilarious. bonus points for linking to the Usher vid. Oh man how I loved Usher back in the day. Ok. 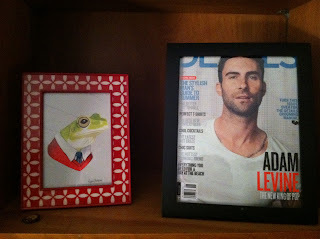 I still love him. You are hilarious and I totally agree with Beth that this should be your profile. I despise dating. It makes me cringe! Case in point: On my very first first date at 23, I was so nervous. I wanted to avoid any long awkward silences so I somehow managed to tell the guy ALL about what it is like to get a Brazilian wax - I mean allllll the deets. Let me just say that that did NOT help the awkwardness. So as long as you don't do that, you are golden. Best of luck on the match! And even if you don't find your Sean Lowe, I am positive you will get some laughs along the way. If you go on a date with any of these guys, please make sure there are at least 3 undercover friends acting as body guards on the premises. You seem like you would be the most fun person in the world with whom to chill. I can guarantee you that I am the least fun person in the world with whom to chill. Yet my super cool husband still married me. I mean, eventually, 7.5 years after we started dating, when he realized that he just couldn't live without my spice cabinet alphabetizing, my no make-up more than 2 times per month philosophy, my no touching me ever policy (well, maybe not ever, but pretty darn close to never), my penchant for wearing a single pair of black knee high boots for an entire year (even during a wicked hot Oklahoma summer), my "I have A pair of jeans, please don't make me go shopping" whining, and my incessant head scratching (seriously, I love to scratch my scalp and I can't stop myself from doing it all the time). Really, I'm such a catch.